b-town report: Where do consumers find open houses? 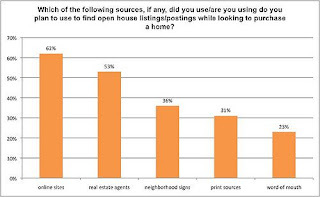 In a recent study from www.trulia.com conducted by Harris Interactive®, online resources still lead the trend in where consumers find out about open houses. Print advertising is used approximately half as frequently by home buyers. Another interesting fact is that 90% of home buyers say that they will visit open houses during their buying process. Attending open houses will probably not connect the consumer with the house that they purchase, but it does help consumers learn the real estate market in their community.